Were You Injured Working on a Job Site? Working at industrial job sites can pose serious risks to employees and workers. In fact, many jobs sites are populated with different companies and contractors, who are all working on different aspects of the same job. The risk of accidents and injuries is greatly increased when companies share a job site. Every workplace has its own set of hazards, but some are far more dangerous than others. Construction sites, steel mills, coal mines, Marcellus shale drilling sites, and factories are too often the setting for serious or even fatal work injuries. Regardless of your profession – be it construction, drilling, carpentry, electrical work, or anything in between – an injury from an accident can change the course of your life forever. 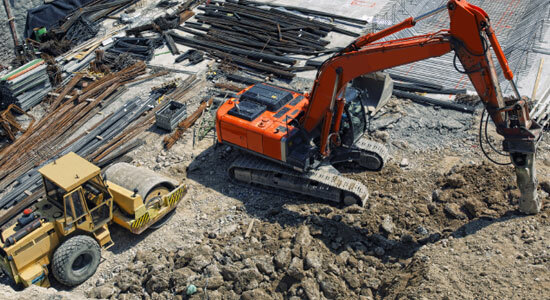 If you've been injured in a job site accident, call us for a free legal consultation. We'll help you understand your options, determine whether your case is workers' compensation or something more, and we'll make sure you get the legal help you need. Call 1-866-943-3427. We're available any time – day or night. Reach us online by completing the form to the right. Chat with a representative by clicking the chat box below. Is Your Accident More Than Workers' Compensation Claim? Some injured workers might not realize that their accident wasn't their employer's fault, but rather the fault of another company sharing the job site. In these instances, your case may be worth something completely different. Contact us to find out more about Third Party Liability. For over 35 years, Edgar Snyder & Associates has been fighting for the rights of injured workers. Our law firm is dedicated to recovering all the compensation you deserve after a job site accident. Don't take our word for it, our work speaks for itself – check out our past verdicts and settlements to see that work we've done. Call us free at 1-866-943-3427 or connect with us online by completing the form in the top right corner of this page. Chat with representative by clicking on the box to the bottom right.